hand then effortlessly tosses it around and the audience delights in watching her play. enjoyable few hours. 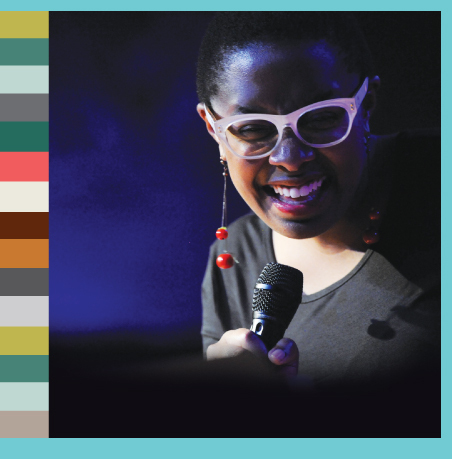 McLorin Salvant opened the second half of her performance with another original composition, “Love Appeared” which will be on an upcoming CD to be recorded with the band that accompanied her. My apologies for not giving credit to her musicians, it would be well-deserved. She honored them throughout the evening by stepping aside and giving them all the space they desired to show off their skills. There is one detractor this reviewer would like to voice, but in the end it may also have been intentional: McLorin Salvant wore a very simple, even plain, dress. For those of you who care about such matters, it was a capped-sleeve, loose-fitting knee-length shift with a simple round neck. Accessories stood out against the bluish-gray (at least in the stage lighting); she wore a red-orange choker with matching heels. Of course, the white glasses completed the look. Or was that the point? To not be distracted by flash and glam? To be consumed by the bubble of amazement that her voice can create? an event not to be missed if such an opportunity comes your way. November 4, 2014 –Everything about the evening I spent with the Quatuor Mosaiques was a delight. First of all, the venue was exquisite. The main building of the Menil collection is one of the best places to listen to a high class string quartet- who would have known that the acoustics there are so great? The quartet played against a backdrop of a large, neon colored geometric art piece and the entire thing should have been filmed and used as a filler for the next intellectual European spy drama. The feel was casual, but very very smart. I felt smart just sitting there. At the beginning of the performance Sarah Rothenberg, the director of the sponsoring organization Da Camera, gave a small talk introducing the group, the pieces that they would play, and how they fit into the general theme of Inventors and Explorers— which the organization is using to thematicize their 2014-2015 season. I am normally against this sort of thing as these courtesies can become tedious and long winded. Sarah Rothenberg kept it short, engaging and highly informative and I found the evening better for it. In my last review for the Houston Critic I criticized how many contemporary classical musicians and groups phone in the first few pieces of the evening and rely on the third, most polished piece to wow and end on a high note. The Quatuor Mosaiques, so far, are an exception to this rule. According to the brief introduction, The Quatuor Mosaiques Quartet modify their instruments to reflect the sounds and treatments produced during the baroque era. The sound is different, perhaps brassier, but quite pleasant and seems to encourage a higher level of blending among the four. Throughout the night, this quartet distinguished themselves as being both true artists and professionals. There was not a weak point in the entire performance, nor a single passage of filler fluff. The first piece was the last, and unfinished, Quartet No. 68 by Joseph Hayden. To be honest, I am not usually keen on Joseph Hayden, and while I appreciate the progress he made and the relevancy of his ideas to the time, I find him in contemporary terms to be systematically colorless and unidimensional. The presentation, however, was fantastic and highly engaging. The first violinist is, contrary to other quartets, not the showiest of the group, but rather the most nuanced and subtle. As a quartet they clearly knew each other very well and moved through the passages a single, unified front. At some points, the two violins sounded like one, weaving through each other’s sound waves like a shuttle through a loom. At the end, I was so sorry Mr. Hayden was unable to finish the 68th Quartet. My taste in Mozart, especially earlier Mozart, is very similar to my taste in Hayden, but yet again I was surpassed at how engaged I was throughout his String Quartet No. 15 in D Minor. This quartet was fascinating to watch and listen to, and not for one second did my thoughts wander away from the performance. The Quatuor coaxed more color out of Mozart than I have ever heard live, and they seemed to weave the music into a story that ran a very surprising gamut of emotion. I love it when musicians all smile and close their eyes at the same time, it generally reflects upon the hearts of the listeners. The final quartet ventured a few hundred years into the future: Robert Schumann’s String Quartet No. 3. Unlike the previous quartets I was, and still am, relatively new to this composer, but that didn’t not infringe on the level of enjoyment derived form the evening. The Quatuor Mosaique Quartet, I have decided, are a joy to watch no matter what they are playing. The Schumann was romantic, and exquisitely dramatic and refined. In particular, the end of the Assai agitato is remarkable and probably very difficult to play. The fade out at the end of the third movement kept me on on the edge of my seat, waiting for more. Unfortunately, I did not catch the name of the encores, due to the heavy accent of the first violinist, but it was, like the rest of the evening highly enjoyable. I look forward to seeing these guys again – I would even be willing to travel for it. 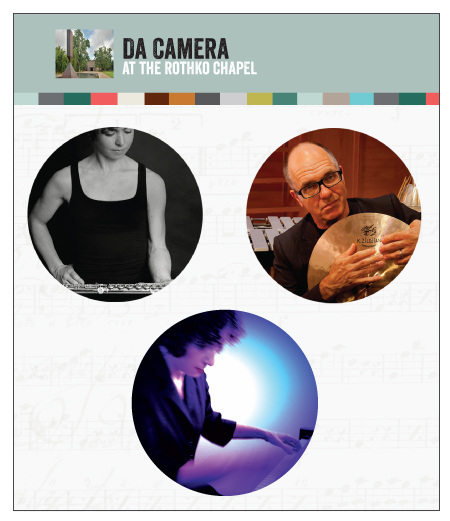 Unresolved, Unresolved, Unresolved, Unresolved, Unresolved, Unresolved, Done November 2, 2014 – Morton Feldman’s “For Philip Guston” performed this afternoon from 1 pm to 6 pm at The Rothko Chapel, presented by Da Camera was and is monumental. This is one for the books. Imagine loving someone so much that you write a five and a half hour song for him. Imagine loving peace so much that you write a musical tribute to the peace effort with no aggression in the music. Imagine what Sarah Rothenberg, Steven Schick and, mostly, Claire Chase who played flute for every minute of that 5 or so hour concert, without interruption or break or barely a place to take a relaxed breath, must be feeling tonight after playing that amazing show. The epinephrine must be high in their systems tonight. Claire and Sarah’s eyes were certainly dilated right after the show. Maybe it was endorphins that kept them playing and playing this enormous softness. I don’t EVER take notes, but this was going to be a long show, so I brought some paper with me. I wrote, “That 243rd note on the flute sucked”. I wrote, “The Tao of low density”. I wrote, “I think the piano player played something three times instead of two”. I wrote “lost track of the count around beat 2100”. I wrote, “How could the critic next to me fall asleep? He might miss something! He snored out of tune and out of time”. I wrote, “I just composed a piece called ‘The Long Note’ (to be performed at The Rothko Chapel) which is to start with the 256 cycle C on baritone flute, maybe, continuing unabated through really quiet changing of the instrumental players who add their C, with or without fuzzy overtone waves and spikes until EVERY timbre is played by EVERY known instrument. I assume it will take some weeks to complete.” Oh, my gosh! Drama at a music show! Did the guy who crinkled paper in time, (I paid attention) carefully playing in time the crinkling of the paper with the music when he needed to move, just slightly, just every now and then, break the peace or did the lady who turned and scowled when she heard paper behind her, even before the concert started do the peace-breaking? Who made the noise that mattered, the lady who whispered ‘stop making noise’ or the poor guy trying hard to move papers around without disturbing anyone? Yes, yes, it seems that that was enough to wreck the peace. The crinkling pieces of paper were enough to do that. The more he did it more carefully, more slowly, more quietly, the more disturbed the lady seemed to get. A guy in a blue shirt noticed the lady being disturbed and gave the crinkler a stern look. He tried even harder to be quiet and to conform with their wishes but to no avail. Once the peace is broken, emotions flare. Self-righteousness asserts itself as righteous and right. What can one do when peer pressure and furrowed brows won’t stop the offender? If he was wiggling his chair or snoring or whispering it would have been forgivable, but he’d been asked to freeze, to comply, to play silent listener and he was refusing to see the music as beautiful constraint, purgatory of anticipation, silencer of papers. Is that what this show was about, I wondered? Was this the oppression of silence? Was it the suppression of ambient sound? Is this sort of peace uncomfortable, like you can’t move your leg without being embarrassed? The lady got up to complain. I could hear her complaining to the usher about the crinkling of a turning page. I’m experiencing the coughs and whispers of approval and complaint and shuffling feet, as well, with peaceful acceptance and tolerance, but the crinkling paper must go? Was this an art music designed to expose the tyranny of the meek, the rule of the most mousey, the beauty of a neighborhood of absolute silence? The usher didn’t seem to think the crinkles were that loud. The lady sat down again. She wasn’t satisfied. The poet’s pen was stronger, for the moment. What do you do with your complaint when no one will pull out a gun to keep the paper crinklers silent? I guess you get up to find a tank. “Let’s go” I heard her say to her companion. Then she said something like “That’s very annoying, the sound of his pencil scratching” It seems that stopping the shifting of papers was not enough. Now, it was too loud for him to be scratching words onto the paper with his pencil. They didn’t move to another spot. There were two chairs together that were easy to get to, but they left…… to complain again? To find a tank? Herbert Marcuse had this famous book that spoke of peace at length during its first half but in the second half claimed that we can only have peace with force strong enough to MAKE peace be peace. Is that the price of peaceful music, that the poets must stop their noisy scribbling? The tank came. The stern general manager asked the poet to stop writing for the sake of peace, or really for the sake of a certain type of silence. Was that the point of this performance? “Let’s lower the volume so that ANY sound is aggression. Silence is Peace!”? But I ask “Can’t peace be joyful? Is it only for the dead, the really silent, the resting, the sleeping?” I guess you’d better walk around to the right rhythm if you want to fit in here. Squeak, squeak my leather shoes sound like syncopation. I took off my glasses and the guy in the blue shirt gave me a glance of disturbance at the loudness of my glasses folding. Then a guy’s phone went off in his pocket. All this and we’re only about 20 minutes into a five and a half hour show. Extra security was dispatched to watch the poet. All that drama almost had me missing the manic nature of those moments of music. Why did I write “Never Leave the Farm?” Is this piece like life making you wonder how long this incessant similarness will last? How long? How long? And then it’s over? We’re now 45 minutes or so into the piece. Unresolved, unresolved, unresolved, etc.? Then “done”? The itchy sections were like dripping water, drip, drip until finally you realize that you’re in a bath of warm water, soothing you. The music is achieving calm by incessant soothing? I think of the peak experiences of my youth when Fripp’s ‘Starless and Bible Black’ could sooth me if my mind was a certain kind of wrong. What wrong is this music tickling to soothe? We’re a couple of hours in and it’s like the edginess of life, the warmth of wool with little itches. The hours go by. The crowd thins and replenishes itself. The famous Ron Knice shows up once the concert is free. I mention him and don’t mention some of the other music notables at the show because I’m a fan of what Ron did when we were children playing our hearts out for the screamers, me with virtual blood, Ron with the real stuff from his heart. This isn’t some kind of musical EST is it? Is this music supposed to drone on until you get the strength to go out into life? What a venue is the Rothko Chapel!!! I remember it being darker during the day, even in bright sunlight. I remember the purple being more purple under incandescent light. Somehow the chapel has a different flavor now that there’s so much daylight coming in through the new skylight. I used to come to the dark chapel in the daylight of the 80’s to escape the drunkenness and AIDS outside. I used to sit for hours so that the purple could burn me, burn my eyes, my rods, I suppose. That 1980’s type of experience of the Rothko Chapel made me think I understood the magic of the place. When I would emerge from the dark-lit interior, burned by the purple, calmed by the white noise, I would see Texas, bright light Texas and nearby green grass and trees as ALIVE and GREEN like no green I’d seen, because the purple had burned my rods or my cones and the outside was VIBRANT again and REAL and OKAY. But this music wasn’t that and neither is the Rothko anymore, with its bright new, blue air inside. Their scheduled lives taking them like death, thinning their numbers, the audience becomes mostly newbies. Dad is there for every second to watch over his baby daughter, to watch Claire blow, so that she knows that love is real and comfort is here. The sound of the music is softer. A false ending has the players finishing each other’s phrases. There is still more than an hour to go. The audience is breathing together. Every nuance is tolerated. Softness, softness, calm. A monument is being built in my memory. And then I get to see into the artists’ eyes. It’s dark outside. The day has given up its greenery. Dinner is calling. I smile for people I don’t know. ON COREA 10.10.14 WHAT IS NO MORE BY Melle Rebel The floating filament of expectancy lands on an evening with a constant, steady, rapid wonder. 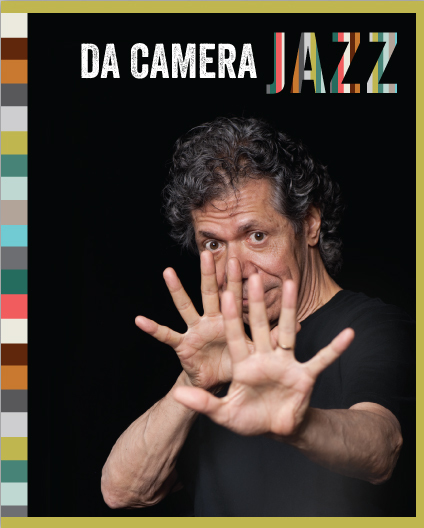 Chick Corea shook the very veins of the Wortham Friday night through several comprehensive piano solos. A guised journey sits along a grandiose setting, warping every sensory measure through a stripped arsenal of purist reproach. A great story told in an immense showcase of skill seeking, nothing less, a recital out of time. In beginning improvisations, the flaw of touch conquers the actual as fingers manipulate intonation with ease. The rich, fluid abyss of thunderstorms and dreams transpire with prolific efficiency. Swift, chromatic displays of Bud Powell transition to Thelonious Monk’s “Blue Monk” and “Oblivion.” Dark, ethereal estrangement of jazz bridges encounter moments of nothing and absolution as they float and arrive along the conveyed emotive intent. The “new standards” of Stevie Wonder blend profoundly into Frederic Chopin. “Stevie and Freddie together.” Other highlights include a selection of his 20 written “Children’s Songs” from the 70s, at the time breaking away from his more produced material. Simultaneous, a storybook familiarity and naïveté of melting crayon wax are sought in quick measure. Rapid, monstrous façades presented to face the elegance of vulnerability, the instant and what is yet to come, Corea embraces an intimate conversation with those who listen. A stranger named “Bobby” is summoned from the auditorium to join in a heated duet. Condensed chaotics entangle a sudden, vast emergence amidst superior content. Its finale, a choral call and response embellished by raw keys. The audience partakes in a phenomenal transition. And then, nothing more. Late Style Now May 2, 2014 The music is great. The orchestra is young and energetic. It’s ICE playing. I’ve listened to the pre-show explanations. I’m thinking the music sounds a lot like a movie soundtrack without the movie, but there is a movie on one of the pieces that is relatively unrelated to the music so it still seems like movie music without a movie. It’s good music: Son of Chamber Symphony, Life, Radio Rewrite, but while the music is playing I’m thinking of a comedy skit that I just HAVE to write. The Conductor seems to be counting out fours but I’m twitching sevens and elevens and the comedy skit keeps invading my brain. We have the band leader and organizer giving a warm-up speech before the show. “We tried for months and years to get the copyright to this show. We’re so honored to be the first people in the South to put it on. By the way, as a side note, we are pleased to announce that we will be the first in Texas to produce his other major work inspired by listening to a cement mixer in our fall presentations 17 years from today. Now, back to this piece. You will notice that it is a bit minimalist in nature.” The band leader interrupts “But he doesn’t like to have it called minimalist” and the other continues, “Well, yes, it isn’t minimalist and…. the first piece is inspired by the oil painting of a kitten playing a purring variation on a symphony that was composed by the son of Bach some years after his death. Now, if there are no questions, to the show” So the show starts and the conductor is displaying time that the band is not playing and the cellist is tapping out different time and the double bass player is tapping yet another time and the mood of the music being played is radically different from the mood of the movement of the conductor and the musicians all look at their sheets of music and their ipads but not very much at the conductor and one out of three times, when the conductor moves her hands to signal the start of something, there is no response. The conductor does an emotional build with her body but the band is still playing the same way. The first piece ends and the conductor points to the old guy in the band and bows and walks off so the instrumentation set up can be changed for the next piece. In a not-at-all speedy fashion some VERY old stage hands with thin long white hair and bent necks shuffle and meander to put amps and guitars and other chairs in new configurations on the stage to get ready for the not so called minimalist piece. Finally, after way too long, the instrumentalists get on the stage. There are many more of them this time than there were for the last piece. The conductor arrives to begin the time-keeping, still a bit remote from the music. The violin plays a single long, long note. The guitar plucks the strings behind the bridge. The cello plucks the strings behind the bridge. The upright bass plucks the strings behind the bridge. The violin plays a short harmonic. The piano stomps on a single chord. The conductor bows and points to the oldest person in the orchestra as the audience claps and the very old stage hands spend the next bunch of minutes preparing for the next piece, taking all the amps and instruments and chairs off the stage, once again. The Radiohead-inspired Radio Rewrite achieved some interesting complexity which might have been more syncopated and a bit harder to play than salsa music. At least, I think it might have been harder to play by the looks of intensity on the players’ faces when playing it. I liked it. It undulated.